In all cultures we see that ritual attire or clothes are a part of the divinely ordained scheme of things. From the shamans in rural areas up to the high magician. The patterns, fabric, symbols all play a role in what make up the special qualities of a certain attire. The attire oftentimes presents a protective value for the wearer as well as the group which is represented by that ritual attire or talismanic garment. The type of protection may vary, but in its most basic sense it is a protection from defilement and decay. Whatever tradition, quality and personal effort is interwoven into the robe is what makes up its worth and magic. The forest green of the mantle, the white on the inside, and certain other quality marks of the Green Mantle, are similar to the mantle used by the chivalric Order of the Thistle. It's origins are uncertain, some sources say it was founded by Achaius in the 8th century C.E. The thistle is a druidic and ancient Celtic symbol of nobility of character - the wounding or provocation of a thistle yields punishment. Fulcanelli provides us with significant detail about the hermetic character of this Order. But its origins go back much further; the Green mantle, first and foremost, has to be seen as symbol of the sacred bond with the Divine and Nature. Throughout written and orally transmitted history the green mantle has expressed the living link between Heaven and Earth: with the Celts, the Sufis, the Egyptians and beyond that, veiled in the mists of time. Green is the colour of meadows and the Water of Life: the long sought elixir immortality. It is the colour of the noble minded and hearty. Tradition demands that the wearer turns one circle when putting the mantle on. This symbolizes the finding of the individual centre of balance and heart in order to know oneself. From this may follow an understanding of the meaning of the emblem on the mantle with its three concentric rings. In honour of the passing of certain milestones in the work and for valuable contributions to the group, Inner Garden offers a small number of decorations to Partners in the form of ribbons. The partner may attach these ribbons to the lapel on the inside of the mantle as a form of talisman. The bestowal of honorary awards has been part of all manner of traditions since the dawn of time, at al levels of society, from King and High-Priests to unknown shaman groups living in the jungle. We honour this tradition but it is by no means essential or obligatory. Each Partner may decide for him or herself wether the addition of a physical award would be an enhancement of the value of the work done in the mundane. At the centre of the universe, at the meeting place of the three cosmic zones of heaven, earth and hell, is the axis mundi, the navel of the Earth, the Tree and sacred centre of life. This is the zone of absolute reality that is the subject of our research and process of creation and re-creation â€“ the Quest for the Centre. In certain conditions, for example those of the Inner Order that associate with the outer, may wear below the cloak a hooded long sleeve in black which is the attire of the Outer Order. Black is the colour of the night and the pupil of the eye. It belongs to those people whose hearts are the treasury of the mysteries and who conceal their affairs from all others. Behind the veils of the saints, beneath the domes of shrines, they pass their hours of remembrance of the Beloved of eternity. Whoever wears this colour should be like the cloaking night and not publish the defects of others. Like the pupil of the eye, he or she should see others but ignore him or herself. One must learning from the pupil of the eye, seeing everyone, not seeing the self. Black symbolizes the hidden centre whereas green symbolizes the ultimate reality. The black hooded long-sleeve may also be worn by all those who are part of the Outer Order. In addition to the above there should be mention of that which one could call â€œthe Third Orderâ€, which encompasses the Divine hierarchy and the higher entities that inspire us. 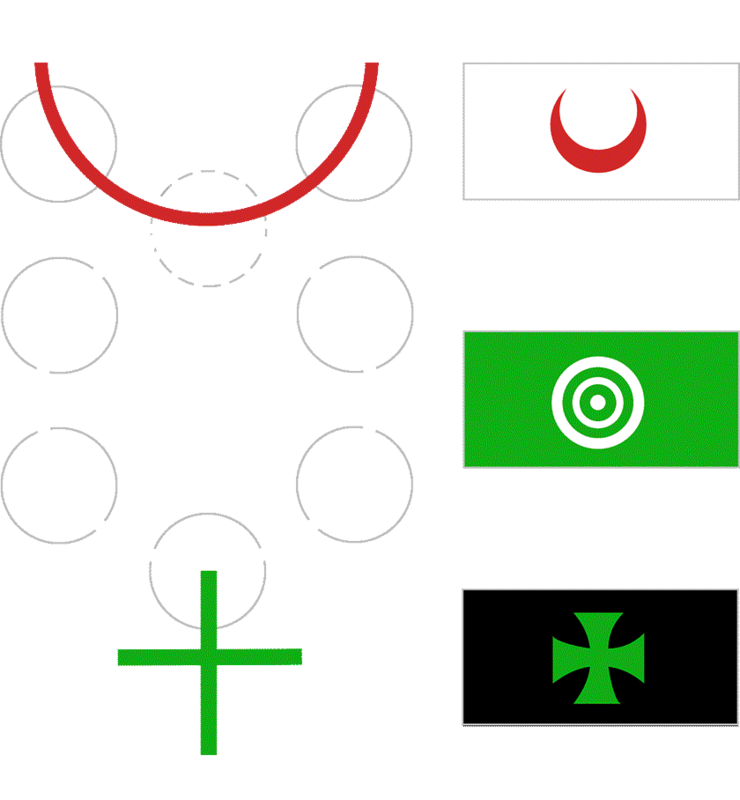 It is symbolized by the Crescent and white clothing. Together with the circle of the Inner Order and the cross of the Outer Order these symbols compose, when ordered from most volatile to most mundane, the symbol of ☿. This symbol compasses the entire Tree of Life, and embraces all except Kether, for which the crescent is the receptacle and intermediary.